Blue Bikes, the renamed Hubway, began unleashing its new blue bikes today, as Stephen M discovered on Main Street in Kendall Square. The renaming comes via an infusion of cash from Blue Cross Blue Shield of Massachusetts. Also in the works: More bikes and bike-rental stations. Hubway, the Boston-area bike-share program today announced a deal with Blue Cross Blue Shield that will dramatically increase the number of Hubway bikes and rental stations. Read more. Hubway will add more than 70 bike-rental stations over the next two years to the 127 it already operates in Boston, under a new contract with the city of Boston, Mayor Walsh's office said today. Read more. And we suspect what was going through the mind of that truck driver on the Expressway southbound by South Bay this afternoon could be abbreviated "WTF?!?" Jeremy Yan, who photographed the furiously pedaling Hubway rider, couldn't believe it, either (note to curmudgeons: As you'll see in the next photo, Yan was not driving): Read more. The Boston Transportation Department announced today that Hubway will be installing 10 kiosks in East Boston for renting its bicycles. The department will hold a planning session at 6:30 p.m. on June 30 at the East Boston BPL branch to help figure out exactly where to place the stations. 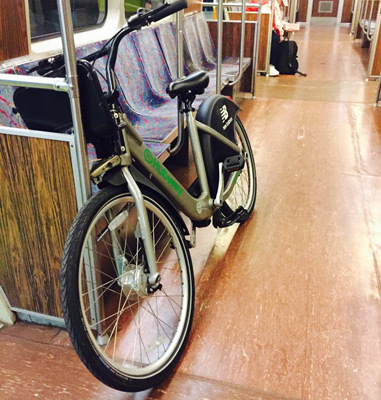 Sarah Kaney noticed a sad Hubway bike abandoned on the Orange Line this evening. Now entering its fifth year, the Hubway bike-sharing program reports it will add ten new bike-rental stations in Roxbury and North Dorchester, thanks in large part due to a $525,000 grant from the Barr Foundation. Hubway announced today its bicycle-rental stations will again remain open this winter in Cambridge - except for the stations at Lafayette Square/Main Street and Dana Park, which will be taken out to let snow plows plow snow. Around 3:35 p.m., Devin Cole spotted three Hubway riders going against traffic inbound on Storrow Drive, near the River Street Bridge. 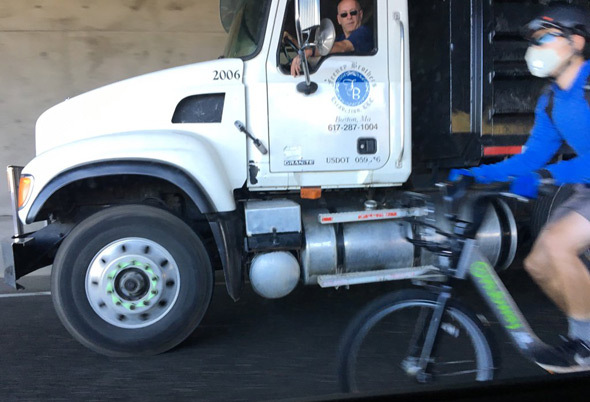 Anyone else in Boston see the four people happily riding their Hubway bikes ON THE MASS PIKE?! Yikes. Hubway reports yesterday marked the first time the bike-sharing service had its bikes taken out for more than 6,000 rides on a single day. Under a new city program, doctors at Boston Medical Center can now write prescriptions for Hubway memberships, as a low-cost exercise option for low-income residents. Under Prescribe-a-Bike, patients will pay only $5 for an annual membership in the bike-sharing system, which gets them an unlimited number of 30-minute Hubway rides. Patients also get a free helmet. Hubway Comes to Trum Field! It started with a conversation with some of my most passionate supporters (right, Spencer?). It led to legislative number 195173 and, today, it was installed. Yes, Ward 5ers, there is a Hubway Bicycle System for Magoun Square at Trum Field! Will test winter rentals this winter. The Jamaica Plain Gazette reports, becomes part of the story when mayor's office tells it to file an official public-records request for information on just which groups city bike commissars contacted before installing the new stations. Around 9 p.m., both Intestinal Fortitude and Swarthy reported a woman riding a Hubway bike on I-90 eastbound just past the Allston/Cambridge tolls. In a possibly unrelated incident, about 45 minutes later, State Police reported a pedestrian was hit by a car on I-93 south by Columbia Road.